Discussion in 'Weather' started by nfip, Dec 1, 2018. Looks a bit biblical for the otways. Faaark. I'm pushing sh!t uphill as it is this last 2 weeks. Claude Cat, Snow Blowey and SnowBound like this. Plenty of thunder, lightning and showers from late morning for me yesterday in Bendigo. The short showers became much heavier as the day went on with the last sound & light show and heavy rain about 1:30am. A very dry year so 26mm in my rain gauge was welcome. SMSkier, Snowy Joey and nfip like this. tho I'm thinking it's more likely Thursday Friday. either way not looking good for the campers later in the week. SMSkier, Claude Cat and Snowy Joey like this. Real potential later this week in much of Vic. There could be some spectacular rain totals if it all comes together. Quite a lot of agreement with each of the forecast models, although complex Lows do have a high degree of uncertainty IMO. Snowy Joey, Claude Cat and nfip like this. 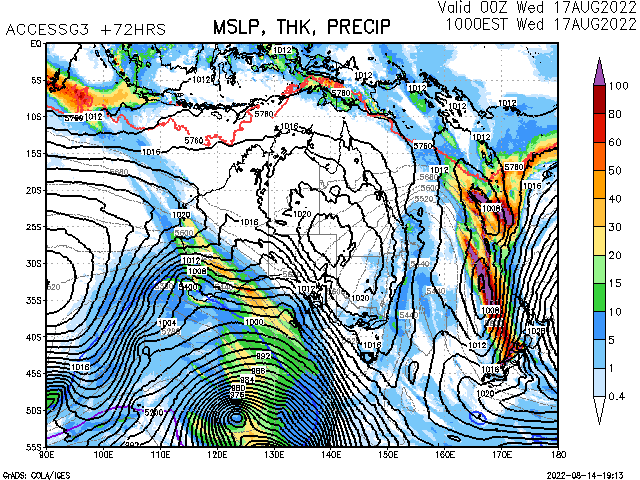 00z GFS now getting southern NSW into the firing line as well. its on the southerly no? Sthly correcto , not much of it but enough to steer it behind us. my thoughts are with the kids at Greenpatch hope they have the same luck. Belly, Ubiquitous Steve, SMSkier and 1 other person like this. Despite the BOM forecast not a drop here at Moonbah today. Snowy Joey, nfip, SnowBound and 2 others like this. There's a good chance coastal centres in Vic & NSW will surpass inland max temps on Friday. A unique scenario for December. Snowy Joey and SMSkier like this. easy said sitting here on the coast ! SMSkier and POW_hungry like this. Thats a real odd pitch map. I'm not sure its right. Hmm it's got a fair bit happening. as modelled. I don't get the gap through the central west towards Sydney. See you've got rotation and central cold pool. Thats the uncertainty of this , or rather both of these. Ex TC Owen and the anticipated cut off. the hot n cold mix. Looks a bit more uniform on axs and ec. Axs g . And out beyond 72 hrs. edit... love Tomerong and Bombala in the locations !!!! Looks like the business end of the deal late Thurs imo. Plenty of instability swirling into the mix with some stodgy CAPE and K Index levels. SMSkier and nfip like this. my punter access msl precip models ( AXS , EC ,GFS ) have had Thursday arvo / night locked in for quite a few days now. 500 anoms also been in sync. Claude Cat, SMSkier and POW_hungry like this. Yeah the train track looks good there. nfip and Kletterer like this. this time of year moar then happy to say the Pineapple word. POW_hungry and Snowy Joey like this. if it delivers out west I'm sure we'll all have the full fruit salad. For me Friday is the mixing bowl for Convective development. Some good EHI values through Sydney and Newcastle. Kletterer, Snowy Joey, Edgecrusher and 1 other person like this. Wow, 100mm+ how likely is that to actually happen? Looks like a bit of divergence between EC and GFS. EC going for up to 60mm'ish and GFS 100mm'ish . Snowy Joey, Edgecrusher, Claude Cat and 1 other person like this. ill believe it when i see it, even 60mm. Latest EC run has backed off the figures for Melbourne somewhat. Thursday is 20mm or so, which is much less than the 40mm originally shown. Friday numbers bumped up though. SMSkier and Snowy Joey like this. We might get 30mm. We might get 100mm. Who knows? Looking like a December to Remember if it's the latter.... A bit like 2007. A dry winter and spring due to a +ve IOD, but we got some big storms and rains just before Christmas that year. These are very big numbers for Melbourne (125 mm). Personally, I dont want 100mm plus as it will most likely cause flooding at work and home. Snowy Joey and Edgecrusher like this. 18Z GFS is unchanged. Lets see if it starts siding with EC later today. Nice steady rain falling in Dubbo for the last 30 minutes. nfip and SMSkier like this. POW_hungry, Snowy Joey, Edgecrusher and 3 others like this. The 3500 km trough. Aint she a beauty. SMSkier, ecowain, Wally and 7 others like this. Simply sensational. A pool of cold air at circa 5000 to 6000 metres. Add some warm moist atmosphere, spin it in circles and what do you get ? SMSkier, ecowain and Snowy Joey like this. Ruined wine crops in the Barossa and Mclaren Vale. How often would they get 120mm in a day from the east? Barossa should be ok i think.